Extremely lovely and uniquely renovated 3 bedroom 3 bath Sealoft villa. The renovations fully enclosed the upstairs bedroom so that it is no longer a loft. The beautiful kitchen features solid surface counters and satina finish appliances. Enjoy wood flooring throughout the kitchen, dining and living areas. The master bedroom on the first level features a king bed, flat screen TV, private bath, and outside deck. The second bedroom, also on the first level offers a queen bed, flat screen TV and full bath. The third bedroom is upstairs. There are two twin beds, a full private bath and deck looking out to the tranquil marsh. You are a very short walk to the community pool! Beach access via Boardwalk #3A is just across the street from the Sealoft complex. There is a propane gas grill for guest enjoyment and WIFI too! We had a fabulous time during our stay. The place was cozy, clean and well stocked with anything we needed. We all slept comfortably and really felt at home. SO close to the beach! We loved walked out to the beach and watching the waves and birds. The owners were very gracious and inviting with all of our questions. We enjoyed a day at Charleston, walking around and shopping, as well as a little history during a carriage tour. We also were very close to the Angel Oak and enjoyed visiting there. We will definitely all be back another time. Great time with family once again at Sea Brook, been coming for over 20 years. This house is our favorite to stay in. Very clean and well stocked with entertainment and all of the necessities. Staff are helpful in addressing any issues at all. This loft is beautifully decorated and in a great location! Loft is very comfortable and had everything we needed. It's really more like a house than a villa as there are no connecting walls with your neighbors. The only thing to be aware of is that the description of the loft says it is fully enclosed but there is no actual door so noise does travel. We had to be aware of this and stay out of the main living area after the girls went to sleep as to not wake them. As long as this isn't an issue, you will love the property! I really liked this rental - the ad says steps from the beach, and that's not really accurate. It's about a 20 minute walk, and with 2 small children and beach stuff, that's a lot. but the small complex pool is right next door - that's excellent and perfect for the kids. the unit is clean and well equipped. And we found that driving to the club house pool adjacent to the beach was a great alternative. Overall, I really liked Seabrook, our first time here and I was impressed. I would stay here again - the price is good and it worked well for us. With grandparents and small children, the three baths were ideal. We don't golf so the proximity to the golf course wasn't helpful. Also be aware, lots of signs in the complex warning of alligators, so if I had my grandchildren playing outside, I was hyper alert, but while we saw lots of deer, no gators. All was good. My only wish is that there had been a better grill! We had a wonderful time in the island, the location of this villa was perfect for walking to the beach and easy access to the pool. A few minor things to note about the house itself. The refrigerator was set by the previous tenant or cleaner to a setting (coldest setting in the freezer) which made the fridge not cool. One positive is that the appliance person was available quickly and came shortly after we called to help us solve the problem. The second thing was that the air conditioning unit is mounted to the underside of the master bedroom joists, so when it runs it shakes the bed. Lastly, the grill that was in the basement did not work. All three of those issues were minor inconveniences so I just mention them as a way to have made our stay even better than it already was. Our son and his family stayed here. We were nearby. With three kids, the extra bath was very convenient; and it was very near our place and the local pool. The kitchen seemed bigger. Perfect. From the rental to the Island, we couldn't have asked for anything more. Overall, our experience was very good at this property. We were impressed with the well stocked kitchen, abundance of beach accessories (cart, boards, games,etc), and the location of the property. The only negative about our experience is that the property is listed as a 3 bedroom, however the upstairs room does not have a door. When I talked to someone at your office, I was told there was a door for the upstairs bedroom. This was an issue for us as we have 3 kids (ages 1,3,5) and we needed a way to keep them in their room to avoid any late night falls down the steps. We felt like this listing was misrepresented and deceiving. This was a fantastic rental. Walk to the beach, yet quiet and secluded-feeling. Very well equipped and very reasonable. Loved it, wasnt ready to go home! Will definitely being visiting Seabrook Island again. The unit 919 Sealoft was a great fit for our family of 5. Everyone had their own space, the unit was clean and the furnishings made our stay very comfortable. 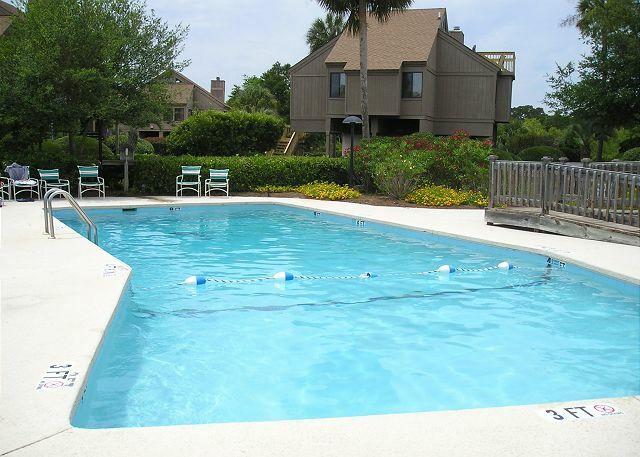 The location of the unit is a stones throw from the pool and a quick bike ride to the beach and pool at the clubhouse. This was our first stay at Seaabrook and we had the best time. 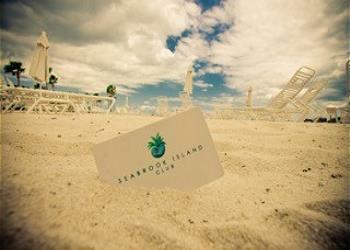 Many great places to eat and the beach was like a private getaway. Best kept secret!!! This was well worth the price. Everything was perfect. Enjoyed our stay very much. The home was very comfortable and very clean. Liked the location of the villa as we had our own "private pool" right outside. I believe we saw someone else at the pool once! Having the albino deer walking through the property was great also! We had a great experience. Charelston and Seabrook with Teens. We loved our vacation to Seabrook. We are parents of a 17 and 19 year old. The Sea loft had just the perfect amount of space for our grown kids. They each had their own bed and bath which made getting ready for the day much easier. We spent a lot of time on the beach picking up shells. The resturaunt the Pelicans Nest was reasonable, delicious and beautiful. We rented bikes and rode around the community and also attended a zumba class at the Lake House. In Charelston we visited the Market, we enjoyed a carriage tour of the city and alot of history, great seafood and unique shopping. Loved our trip. The only issue we had at the house was the air conditioner was located right beneath the master bedroom and was quite moisy. It seemed to be having difficulty keeping up with the hot days. Other than that the Sea Loft was well equipped, comfortable and beautifully decorated. This property was in a great location. Across from the community pool and a short walk to the beach. It was clean and had plenty of room for our family. Would rent this villa again next!!! Property was great and would definitely stay again! My wife, our daughter and son-in-law and two granddaughters had a wonderful time. 919 Sealoft was nicely decorated and very clean. It was well stocked with all necessities. Our stay at 919 Sealoft was a great getaway for Fall Break. Property was well appointed and clean. 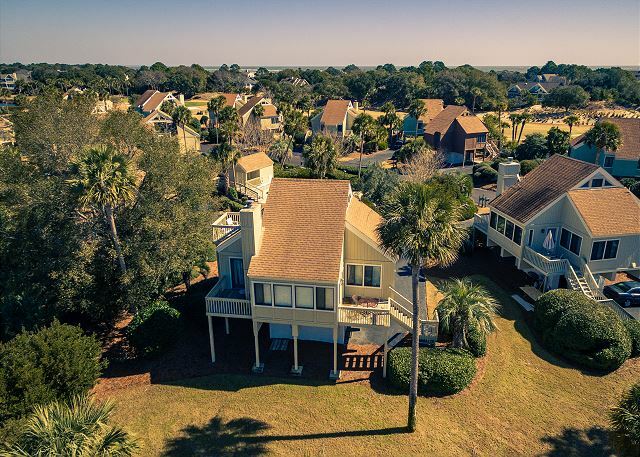 We've been to Seabrook several times and this property had a lot to offer. 5 of us ( 4 adults, 1 teen) fit comfortably). The one disappointment was the grill. We had planned to grill out A LOT...and the grill was not adequate. It was a stadium/cook out type grill. We tried to use it one night, and it barely cooked our chicken. We didn't let this one detail derail us... but it changed how we planned to do dinners. There are fine places to eat in the area - we took advantage of those. Wifi worked - but was slow; cable was available - but more channels were available on the TV in the loft area. We didn't watch much tv, but thought this was interesting. Perfect property for two couples or a small family. Kitchen well appointed, decor charming beachy, beds comfortable. Beautiful grounds with nice amenities at the resort, multiple pools, though was too cold to swim during our visit. Only minor downsides, not many restaurant choices close by, and grill was only a tailgate size. Other than that Villa had everything we needed for a lovely stay. 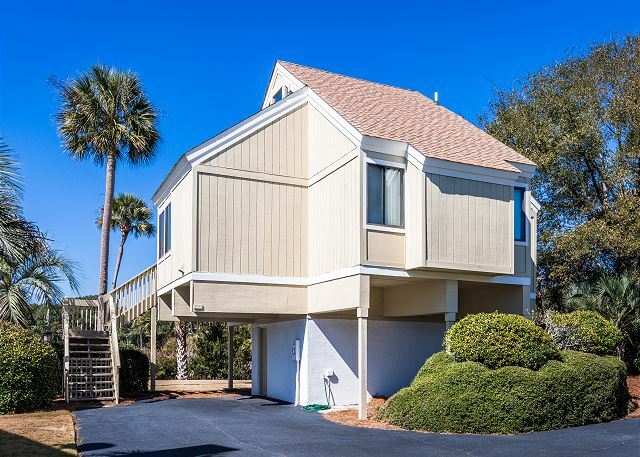 Seabrook Island is private gated community, quiet, peaceful, lovely beach walkable, exactly what we wanted for a relaxing getaway.